These contemporary-designed bath and shower seats are equipped with the patented easy-to-use Exact Level™ system. It has large, easy-to-grip handles and molded-in storage areas for hand-held shower spray. Ideal for people requiring a larger seating area. 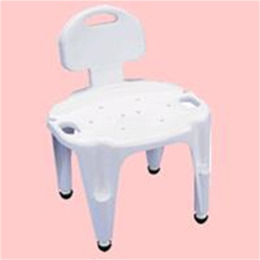 The seat is available with or without a back and has "S" shaped drainage holes to eliminate graywater pooling. 300 lb. weight capacity.